Abstract: The present paper will try to analyze some crucial features that can highlight the differences between English for legal purposes (ELP) and General English (GE). It focuses on use of (ELP) as a medium of instruction within practical field of Law. The study will deal with a fact that lawyers are the most eloquent users of English language. Where, on the other hand, they are its notorious abusers. It is because they employ arcane vocabulary within their discourses. The most controversial features that underlie within this field were to be analyzed from different perspectives: (1) its practicability to legal language’s nature (2) semantic interpretations of legal interpretations and (3) perceptual differences over statues of applied and real cases. A language policy program was conducted for this purpose in SM (Sind Muslim) Law College, (Hyderabad) Sind, Pakistan. Its goal was to analyze the particular needs of the legal learners towards their use of English language. After having the discussions with stakeholders, learners, experienced interlocutors and advocates themselves, the researcher, then analyzed some of the case methods (legal books). It was considered a necessary concern to have particular model that should design a conclusive course of integrating the language learning with legal content. This study falls with three major categories in the end for future scholars. (1) Study of Specific English language within legal field. (2) Study of spoken English language within legal settings and (3) Study of written English language of law. However, the main attempt is to explore the third category, focusing on controversial features within written form of legal English language. This study will also help future ESP course designers to visualize the underlying facts that are important in present era. It will not only improve the learning purposes but to strategies for teaching methods. Therefore, it is important to analyze the controversial facts of ELP course. Abstract: English for Specific Purposes (ESP) is the field of language teaching and learning of English in a specific area of specialty. However, learning ESP is not to be understood as just learning a set of technical vocabulary and expressions; it is about learning to use English in a given specific context with the implication of all the skills and objectives of language learning. This qualitative research investigates the impact of Content-Based Instruction (CBI) on developing comprehension and vocabulary in a course of English for Specific Purposes at an engineering school in Morocco where English is learnt as a Foreign Language (FL). A total number of 40 students were divided into two groups of 20 students per class and were taught a fifteen-hour course of legal English over a period of six weeks. Each class lasted one hour and fifteen minutes, at the pace of two classes per week. Focus was on reading comprehension and learning vocabulary in an interactive way by engaging the learners actively. At the beginning, both groups were given the same pre-test to determine their present knowledge of legal English. After the experiment period, another post-test was administered to the students to determine their level of progress. At first, the results of both groups in each test were compared with each other. Then, the results of each group in the pre-test were compared with the results of the same group in the post-test. The general result is that both groups have made progress in improving comprehension and vocabulary capabilities in legal English. As for same-group results, the experiment group have managed to make significant progress in their post-test results compared to their pre-test results, while the control group maintained their higher score shown in the pre-test. The conclusion drawn from this is that Content-Based Instruction does help students improve their comprehension and vocabulary capabilities in ESP. Therefore, focus on content does yield positive results in learning language. Reducing content to just a topic through which learners learn language may cause the learners to miss a learning opportunity. Thus, there may not be a reason to give the content aspect of a language course less importance than the language aspect. 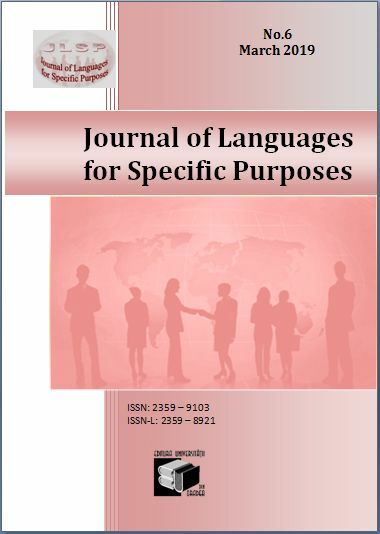 Abstract: Languages for specific purposes is a subdiscipline of applied linguistics that looks at language learning and teaching for a specific education or training need. The long-established norm of this field is the teaching and learning of spoken languages. Sign languages have been excluded. This paper calls attention to this gap in the field and shows how a sign language can be taught and learnt for a specific purpose. This empirical work describes how students training to be healthcare practitioners are taught Jamaican Sign Language with a view to improving communication with Deaf patients when these students become healthcare practitioners. Overviews of course content as well as teaching and assessment methods are examined in light of the tenets of the field of languages for specific purposes. This is to assess how the content as well as teaching and assessment methods compare to current practice in the field of languages for specific purposes. Benefits of this programme are also presented. It is hoped that this paper sparks a much-needed discussion in the field of languages for specific purposes on the inclusion of sign languages and what best practice would look like in a subdiscipline of sign languages for specific purposes. Globally, the number of sign language courses offered at higher education institutions is increasing. It is a logical conclusion that more institutions will begin to offer sign language courses tailored for specific settings. The demand for such courses is just beginning. The need therefore to address the question of the place of sign languages for specific purposes within the field of languages for specific purposes is urgent. Keywords: sign language; healthcare; languages for specific purposes; communicative competence; higher education; Jamaica. Abstract: Several factors have affected higher education during the last few decades across the globe, as a consequence of which, teachers nowadays are facing unprecedented changes and challenges of the 21st century. Due to fast developments in technology, digital competences are of major importance today for both students and teachers. Many language teachers as well as teachers of languages for specific purposes are therefore constantly faced with the question of shall we or shall we not let digital technology into our teaching activity. There are pros and cons to integrating online Web2 technology into the curriculum, just as there to teaching with the traditional methods of offline materials, books and exercise books. Both options have their own advantages and disadvantages, however, the number of those, who focus more on how we should use digital technology in class, instead of whether we should use it at all, is on the rise. Digital tools can be used to our advantage when teaching, nevertheless, this is not an easy task as new digital resources and various apps reach us almost on a daily basis. Which one to select and implement in class that suits the students’ needs and provides authentic materials for classes of languages for specific purposes, which at the same time, will not quickly seem outdated or disappear, is a constant challenge we have to face. The aim of this paper is to investigate the notion of digital education, including digital classrooms, digital students and digital teachers as well as the teaching methods of the 21st century pertaining to language classes, especially focusing on language classes for specific purposes. In authors’ understanding, digital tools can be used as a potential source of stimulation from which to launch into interactive communication keeping a healthy balance between the sensory and the digital resources. Numerous educational digital tools emerge every day, which require special skills, knowledge and competence, therefore teaching with or without them cannot and should not be imposed on language teachers, instead, this decision should lie exclusively in their hands. Abstract: The international demand of having speakers who are fluent in a multitude of languages is a significant one. The term ‘fluent’, by default, means that the speaker can continue a conversation (or their speech) without any possible hesitation or with only marginal ones. However, this is often not the case, as it can be seen both in everyday conversations with foreigners or delivering a speech at an international conference. Many non-native speakers of a language are facing difficulties when in a verbally challenging situation and as a result, come across the phenomena of a ‘communication breakdown’ or an episode of TOT (tip of the tongue). These two phenomena can be rather embarrassing for the speaker, resulting in a weakened self-esteem and may lead to the start of a negative spiral; a spiral that, in extreme cases, makes the speaker avoid communicating with foreigners all together. To help non-native speakers avoid such unpleasant situations, the usage of communication strategies should be carefully considered. In the following paper, the results of an online questionnaire will be presented, regarding the usage of communication strategies by Hungarian students and teachers of a secondary and tertiary level of education. The aim of the research was to shed light on the usage of communication strategies in modern offline conversations occurring between native speakers of a language and non-native speakers of the same language within Hungary. Some of the arguments presented in this paper are concerned with the most frequently used communication strategies used by Hungarians on such occasions; the research findings here seem to contradict that of common experience. Regarding taking the initiative if facing a foreigner in a conversation Hungarian speakers again seem to present a contradiction to popular belief. Furthermore, the notion of communication strategies and their likely conscious use is also dissected only to present some expected end results. In addition, the paper examines the possibility of teaching communication strategies in a school environment, while also considering the likely hindering factors and obstacles that could prevent students from acquiring above said strategies. It is worth noting, that teachers of a foreign language might want to pay attention to the question of teachability when it comes to communication strategies, both inside and outside the language classroom for the sake of a more effective future of language education. For this purpose, a section about this issue is also presented in this paper. Abstract: This study compares a STEM and a non-STEM British university’s Japanese marking criteria using two cultural concepts as a framework. There are movements in language teaching to focus on teaching specific purposes. The findings show that the two types of assessment criteria, simple and detailed assessment criteria exist, which were under the influence of these two cultural concepts. Language teachers who use simple assessment criteria grade students’ work more objectively using quantitative method, whereas those who use detailed assessment criteria grade more subjectively. Language teachers who use detailed assessment criteria may have less workload marking and grading than those who use simple assessment. However, the grading quality of those who use detailed assessment criteria may not be as consistent as that of those who use simple assessment. In addition, the emphasis on either creativity or accuracy is related to simple or detailed assessment criteria. It is recommended to incorporate some aspects of simple assessment criteria to improve the consistency of the grading if an institution uses detailed assessment. If an institution uses simple assessment criteria, it is recommended to incorporate the clarity aspect of detailed assessment criteria. Abstract: In the context of growing efforts for becoming more international and, hence, more attractive for staff and students worldwide, higher education institutions implement and support English Medium Instruction (EMI) and try to enhance visibility of research results through publishing in English. The resources necessary for this successful enterprise include a teaching and research staff highly proficient in using English both for teaching subjects other than English and writing materials based on research. The general context of EMI can be further complicated by local factors which add to the complex puzzle of forces that shape higher education today. The present paper describes and analyzes the case of a Romanian higher education institution which, although offering English taught programs for over a decade in several engineering fields, has only recently decided to reconsider the needs of the EMI teaching and research staff and to provide ongoing support, with the view of increasing quality of EMI education and also of adding new programs taught in English. The recent support program consists of three components: language courses focused on speaking and listening skills and on grammar-discourse features of written texts, pedagogy-focused workshops and a one-to-one tutoring support for editing and improving the accuracy and readability of research-related texts to be published in English. The components were implemented as an integrated system which has fostered collaboration between language and content teachers involved in EMI. Informing each other in both practice and research, EMI and TESOL (here represented mostly by English for Specific Purposes) form a productive symbiosis when all stakeholders are involved. The implications of such cases can be consequential for the further development of support programs for EMI teaching and research staff, based on specific needs of local EMI communities of practice and on principles derived from the language and content teachers’ collaboration. Title: COMMUNICATION SKILLS WHICH INCREASE STUDENTS’ EMPLOYABILITY: ARE WE TEACHING THE SKILLS THEY NEED? Abstract: Communication skills are among the top generic (soft) skills required by employers today worldwide. The major question this paper strives to answer is: what are the real work related communication skills that university students need to develop? It also focuses on determining the extent to which these needs match the objectives listed in the ESP for Business courses syllabi offered at the Language Centre (LC) at the South East European University (SEEU) in the R. Macedonia. At present at the LC at SEEU the same syllabi and the same teaching materials are used for teaching Business English to full-time undergraduate students with no previous working experience and to part-time undergraduate students, majority of whom are employed and have previous working experience. Currently, most emphasis in these courses is placed on developing speaking as a skill at the expense of slightly neglecting the development of business writing as a skill. This paper summarizes and reports on the findings from a small scale field research surveying the work-related communication needs of 20 employed undergraduate part-time students attending basic skills English courses at the LC at the SEEU as preparation for subsequent ESP for Business courses. An anonymous questionnaire was used as the main data collection instrument. The survey revealed that interpersonal oral communication was ranked as number one priority by the participants. This practical research paper rooted in the author’s daily teaching practise should be of interest to ESP for Business teachers constantly revising and improving the syllabi striving to create an ESP for Business course tailored to their students’ real needs. Abstract: The last four decades have witnessed the birth of numerous studies dealing with the research paper (RP), its rhetorical structure and contents, linguistic features, reporting verbs, review procedures, evaluative language, peer editing, transfer of academic writing skills, and many other features. In spite of the countless researches detailing academic writing features, not a small amount of textbooks on academic writing seem to ignore the results yielded by research conducted on this vital and crucial skill. A great number of academic writing textbooks seem to be unaware of the findings of research on academic writing practices. Thus, it is the purpose of this paper to briefly survey a number of academic writing textbooks claiming to be designed for teaching and developing university students’ academic writing skills and introduce the present author’s attempt in utilizing Swales’ IMRD and CARS patterns in teaching the overall rhetorical structure of academic research papers to tertiary students. The current author strongly believes that academic writing is an apprenticeship process. That is, the students should be shown samples of what they are expected to produce before they actually do it. Therefore, students were, individually, requested to find a journal RP, of 15 pages maximum, in the area they would choose for their research from any peer reviewed journal that uses APA style, print it, highlight only all the section headings, copy them on a separate sheet of paper and bring to the following class. In the second class session, students were divided into teams of 4, and were asked to share and discuss the research design patterns they identified. Then, they selected a representative team member to write the sections and subsections headings they found common in the research design on the whiteboard for all students to see. After this, a whole class discussion of the similarities and differences began. Then, Swales’ models were introduced for comparison with what they found. Using Swales’ models made it easy for students to think in an organized way and assign the information that they had gathered to their relevant sections/move(s).The students’ feedback was encouraging and the research papers they produced corroborated their positive responses. Abstract: During the process of internationalization, interpersonal communication has been transformed into intercultural communication involving people from different cultural systems that communicate effortlessly with each other. The present study focuses on the inductive methodology that is followed at the Hellenic Army Military Academy in order to help cadets to acquire communicative skills while absorbing the knowledge of English or French language, literature, and culture. The inductive methodology gives shape to an innovative teaching approach as English and French become languages of special purposes, taking into consideration the needs and requirements of the contemporary international environment. The Hellenic Army Military Academy provides a multidimensional and of high quality, military academic training that lasts four years. Teaching foreign languages, particularly English and French meets the prospects and commitments of the Hellenic Army Military Academy and the Hellenic Ministry of Defence. Because teaching English and French and Military Terminology is accomplished simultaneously in hellenophone and allophone speaking cadets during the first two years of their academic program. Given the heterogeneous cultural and linguistic contexts, lectures are oriented towards participatory learning so that all cadets are activated to the educational process. The subjects of English and French Military Terminology and War Literature are taught during the third and fourth years at the Hellenic Army Military Academy in order to aid cadets in acquiring the necessary reading, writing, listening and oral skills that will enable them to attend the Annual Spring Program of Military Erasmus as well as the academic programs of the Anglo-Saxon universities they will go to after graduation. Authentic English and French texts and historical, political and fictional texts have been selected concerning the organization of the army, the art and act of conducting war as well as the experiences of American, English and French war veterans. By the time cadets graduate, with the help of their lecturers who assist them in the difficult task of providing them with vocabulary activities, oral, writing and listening exercises, they can speak two European languages and know the military terms, phrases and idioms that are usually found in military texts in order to use them when communicating with their colleagues abroad. Abstract: In EAP (English for Academic Purposes) writing pieces such as articles, theses, and dissertations; convincing the reader to read the rest of the written material is of high importance. The literature presents several models to follow while writing abstracts. Based on this, the current study investigated the textual, organizational and rhetorical structures of the Ph.D. dissertation abstracts written in the Turkish and American contexts. The structures of abstracts were analyzed based on Hyland’s (2000) model for writing abstracts. Additionally, the author presence markers and hedging devices used in the abstracts were investigated. A comparative analysis of EAP writing examples from the two contexts -Turkish and American- revealed that there exist observable differences in terms of abstract writing especially in the organizational structures and the use of hedging devices. The results of the study suggested that in both contexts there is a need to reconsider academic writing education. To be clearer writing abstracts should be handled more carefully by the professors of academic writing instruction. Abstract: Are letters still important? Are business letters as the classic means of communication needed and important to be taught during language classes these days? Or should the new and modern means of communication prevail over the classic written pieces of paper? This article discusses the findings and implications of an investigation meant to answer these questions about the role of business correspondence in English (i.e. email, letters, memos, faxes) and this is done as a case study addressed to the local door market. The results are based on four sources: 1. a questionnaire that had two versions: an online survey sent by email to 150 alumni of The Faculty of Economics, University of Oradea and to 8 companies and professional associations, and a paper-based version distributed to 80 professionals, who included students undertaking undergraduate and postgraduate programmes; 2. semi-structured interviews with 8 professionals, 3. analyses of 25 email chains comprising 190 separate messages, and a “week-in-the-life” case study. All these cover half a year span of investigation. This research comes with relevant information about the role of email versus letters, memos and faxes in the globalised workplace, the purposes and characteristics of these text types, and the challenges that Romanian professionals experience when writing business correspondence in a second language. The article argues that the irrelevance of the traditional approach of business English courses (letters, memos, faxes) when it comes to the needs of modern-day professionals and need for email and netiquette focus as the core of updated instruction. Abstract: The dimension specific vs. diffuse means that in specific cultures the areas of life are clearly separated and encounters with other people are also considered in these categories. If you deal with a person in different areas of life, you behave according to the situation. The opposite is represented by diffuse cultures, where the areas of life are mixed together and the access from the public sphere to the private sphere is easier. In relationships, one behaves indirectly, seemingly aimlessly. One is often evasive and ambiguous. Specific vs. diffuse can also be recognized in the way the advertisement is carried out, the interactions between people and the type of persons represented, as well as the way in which the message is conveyed and how it influences and reaches the target group in the different cultures. Abstract: Fons Trompenaars describes with the dimension neutral vs. emotional how far it is possible to express emotions in public in different cultures. Emotionality includes not only outbursts of emotion, but also everyday appearances such as smiling, gesturing, i.e. also non-verbal forms of communication. In neutral cultures, the emerging feelings are controlled and rather kept to themselves. In discussions it is mainly argued on the factual level. There is a low-context verbal communication. Neutral vs. emotional can also be recognized in the execution of advertisement, the interactions between the characters and the type of persons represented, as well as in the way the message is conveyed and how the target group is influenced and reached in the different cultures. Abstract: Since the 1960s, there has been increasing interest in the teacher’s professional qualifications in didactics, leading in some ways to the ‘dehumanization’ of the teacher. And yet it is the teacher’s personality that often determines his/her educational and didactic influence on the students. The aim of this article is to present a portrait of the so-called good foreign language teacher, which has been created on the basis of the comments made by about 840 Polish students of modern languages, and pupils representing various types of schools (from primary schools, through middle and secondary schools, to colleges and universities) in two voivodeships of Poland, namely Podkarpackie Voivodeship and Wielkopolska Voivodeship. In this picture, teacher personality traits, the majority of which are regarded as values not only in professional life (e.g. in the teaching profession), but also in personal life, have ranked the highest. Personality traits have overshadowed the other two groups of qualities, which foreign language teachers are also equipped with, i.e. didactic and glottodidactic ones. On the basis of the results of our research, it can be stated that the respondents (regardless of the educational stage) are inclined to perceive the (foreign language) teacher mostly as a good man, and not as a programmed robot, possessing a wide range of skills and competences. The respondents’ beliefs are, therefore, closer to the psychologists’ and pedagogues’ beliefs from the first half of the twentieth century than to contemporary concepts, in which a ‘good teacher’ is characterized as possessing only an appropriate, specialized education. Abstract: We understand language as the most important means of communication that is particularly aimed to express various opinions and behaviors, not only in peace but also in times of war or in times of threat, as escalations of a conflict, and as a continuation of politics by other means. The emotionally-evaluative lexic of contemporary German language is rich and diverse in its lexical and semantic structure. In this article, we make an attempt to examine and analyze the “lexems of violence” in the emotionally evaluative lexicon. Characteristics of this type of lexicon are nouns that express violence, namely so called Mordlexeme (Massenmord, /mass murder/ Völkermord /genocide/); Blutlexeme (Bluttat, Blutbad /bloodbath, slaughter/); Drucklexeme (Druck /pressure/, Drohungen /threats/); Mafialexeme (Politmafia /politmafia/, Mafiosi /mafioso/); then Gewaltadjektive (brutal, gewaltig, grausam, verheerend /brutal, violent, cruel, devastating, catastrophic); Gewaltverben (terrorisieren, foltern, massakrieren, zuführen / (terrorizing, torturing, massacring, missconduct) etc. Furthermore, we give some examples that are derived from nouns and are mainly used in texts of the press and journalism; Flüchtling- (Flüchtlingselend /misery of the refugees/, Flüchtlingstragödie /tragedy of the refuges/), etc. We examine the “Gewaltlexeme” because they have an outstanding position in public discourse. Abstract: Foreign languages in general are taught through the communicative method. The grammar-translation method is considered obsolete today, and that is why translation tasks in foreign language teaching (in Hungary) are used only in secret, if at all. However, with this we neglect the development of certain skills, and make the development of subordinate bilingualism into coordinate bilingualism more difficult. Based on language teaching methodology, results on the mental lexicon and empirical research results, this paper argues for restoring translation in teaching German as a Foreign Langue to the place that it duly deserves.